One more thing about this season’s unanimous American League Rookie of the Year, and possible American League Most Valuable Player. At some point, we’re going to fully move on beyond 2017, and all the numbers will just be a part of the record, only occasionally reflected upon. I want to dedicate one more article to what Aaron Judge just did. What he did, that is, and what it means. We all probably have our favorite Aaron Judge highlight clips. “Favorite” might be strong, if you, say, root for the Red Sox, but we all remember certain moments. I imagine a lot of people out there most greatly appreciate Judge’s hardest-hit home runs. They’re spectacular, the lot of them. Yet, maybe it’s recency bias, but I haven’t been able to stop thinking about a Judge double from early last month. Judge, you’ll remember, was struggling in the ALDS against the Indians, and then, in Game 4, Trevor Bauer threw him something hard, high, and tight. The chyron down there exaggerated things, but the ball approached the plate at 96 miles per hour, and it left at 98. By the standards that Aaron Judge set, a 98mph batted ball is barely enough to get your attention, but it’s not just about the batted ball itself; it’s just as much about the pitch that Judge turned on. Everyone struggles against the pitch up and in. Everyone has a difficult time making hard contact against the pitch up and in. Judge didn’t by any means make perfect contact, but the contact was plenty good enough. It was a screaming line drive, after Judge shortened up. Again, we all remember the balls that Judge hit around 120 miles per hour. 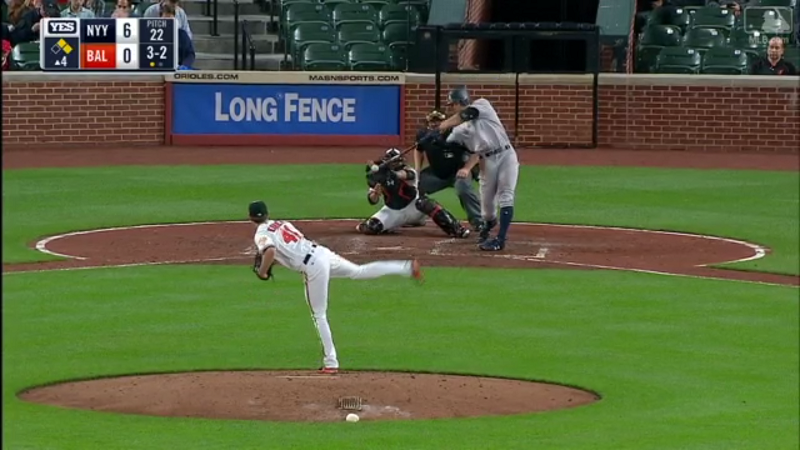 He hit this pitch at 113. He hit this pitch at 112. 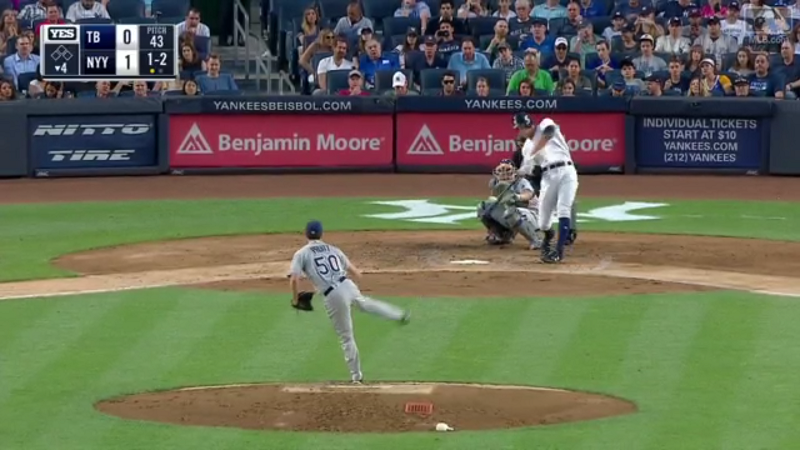 Thanks to the wonders of Statcast, we know what Judge can do when he hits the ball just right. You can play around on Baseball Savant for ages. Judge is closely associated with the term “exit velocity,” because Judge has become its powerful king. A statement you’ve probably read dozens of times, or thereabouts: Aaron Judge hits the ball harder than anyone. We would’ve suspected that, without the tracking systems, but now we can know it for sure. Aaron Judge, hard hitter. All right. What might not be fully appreciated is what that means. What it means is that Judge isn’t exactly playing by the usual rules. To show you what I’m getting at, I’ve prepared a plot. 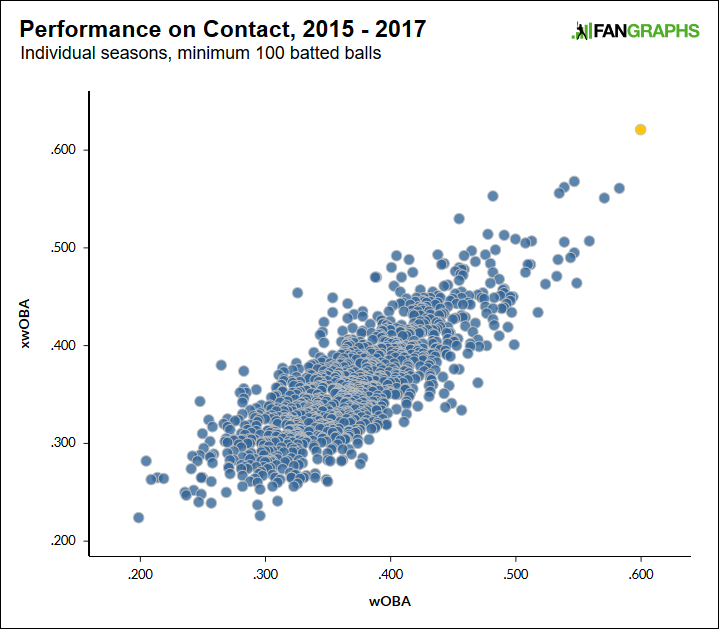 I looked at every individual batter-season from 2015 to 2017 with a minimum of 100 batted balls. For every player, I found the wOBA on contact, and I also used Baseball Savant to find the expected wOBA on contact. So this is wOBA without walks, hit-by-pitches, and strikeouts. Judge is highlighted in yellow. You’ll see him. Judge just had the highest wOBA on contact in at least three years. He also had the highest expected wOBA on contact in at least three years, and he’s in the lead by 53 points. The name below him, unsurprisingly, is Giancarlo Stanton, but Judge’s data point is extraordinary. By wOBA on contact, Judge just finished a full four standard deviations higher than average. By expected wOBA on contact, meanwhile, he was 4.7 standard deviations higher than average. Stanton, in 2015, was at +3.7 standard deviations. Judge was one standard deviation higher than the next-closest point. The explanation is simple, and it’s the one you already know: Judge hits the ball the hardest. But let me maybe help drive this home. Overall, last season, Judge posted a .430 wOBA. He did that while striking out almost 31% of the time. There’s concern that Judge might strike out more often. I calculated where Judge would’ve wound up, keeping everything the same but bumping his strikeout rate up to 40%. At 40% strikeouts, 2017 Aaron Judge would’ve still finished with a wOBA of .374, essentially matching the season put up by Edwin Encarnacion. Judge would’ve been great while striking out at a frequency that, for just about anyone else on the planet, would be catastrophic. In terms of current or recent baseball, the closest thing to Judge is Stanton. That was the talk when Judge was a prospect, and now so much more has come true. Yet Judge might even have an extra gear. He just beat 2015 Stanton in wOBA and expected wOBA on contact, and he also beat 2015 Stanton in his rate of the best-hit batted balls, which Statcast calls “Barrels.” Stanton gives us our closest comp, but Judge is otherwise way the hell out there. He’s incredible by his peak contact, but he’s no less incredible by his below-peak contact. He can squeeze line drives and extra-base hits out of pitches other guys might pop up. I go back to the Bauer double, again. It’s just a sample of one, so, who knows, but that feels like something indicative of Judge’s atypical ability. Bauer even said later he thought he threw a good pitch. He threw a very good pitch. 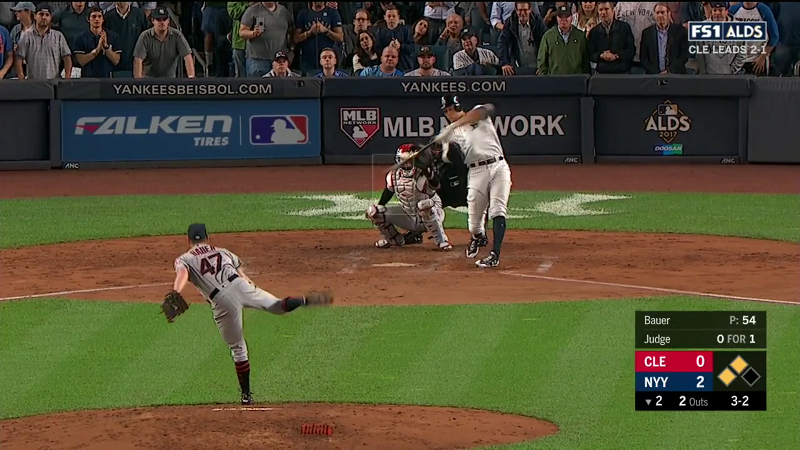 Judge somehow clobbered it. The point you all knew: Judge hits the ball the hardest. The point that’s less obvious: That means Judge gets to play by his own rules. Strikeouts don’t mean for him what they would for someone else, because Judge doesn’t need a low strikeout rate to be good. He doesn’t need a low strikeout rate to be terrific. He doesn’t even need a low strikeout rate to be a deserving league MVP. Statcast has revealed the whole truth of Aaron Judge, and the truth is that, at least in the American League, he is one of a kind. That might make it harder to see the future, but then, maybe, it doesn’t make it harder at all. We hoped you liked reading Let’s Make One Thing Absolutely Clear About Aaron Judge by Jeff Sullivan! His zone rates are all pretty solid even for the amount he strikes out, so as long as he continues to develop as a hitter I would venture to guess that K-rate would go down, especially as umpires finally learn how to call balls and strikes properly against him. That’s a scary idea for opposing pitchers. It’s a scary idea, but the bottom of his zone is being called inordinately low. I don’t know how a player can be expected to “develop” around that. Do umps annually review player accuracy? Well, I meant more that as he develops as a player, his pitch recognition should improve to the point where he lays off more and more of the outside corner junk balls. As for the umpires, it’s extremely frustrating that he has to deal with that low zone – but eventually you would think that as Judge accrues service time that he would get a little bit more of the benefit of the doubt, and that the umpires would learn from their mistakes. The latter might be wishful thinking but I would hope that he wouldn’t have to deal with an unreasonably large strike zone his entire career. I know that it affects him considerably less (bottom of the league in pitches taken/only 33% of pitches are high in the zone), but the umps still don’t seem like they’ve adjusted to Altuve’s top end. Looking at last year’s breakdown, they missed a lot of calls (to his detriment) last year, and he has significantly more service time. That being said, the zone does seem to traditionally tighten or widen for veteran hitters or pitchers, respectively. The beginning of the year he had better pitch selection but when the umpires continue to call low strikes on you you either just take it and argue or try to put a bat on the ball.